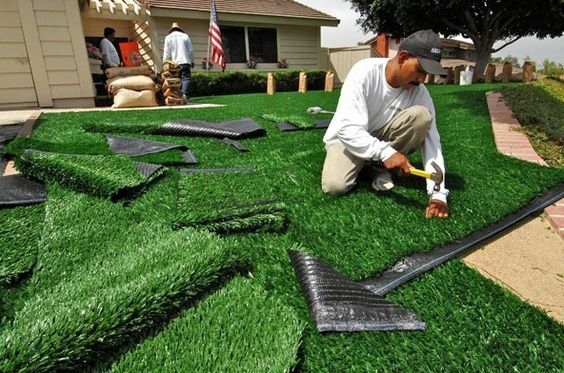 Installing artificial turf in place of natural grass provides homeowners’ with numerous benefits. If you choose to use artificial lawn materials, you no longer have to spend an excessive amount of time or money to maintain your lawn. The time and money you save by not having to mow on a regular basis will more than cover the additional cost of the artificial turf over its lifetime. Like mowing, trimming adds to the financial upkeep of the lawn. Having to repeatedly purchase oil, gas, trimmer line and pay for repairs can be a financial drain if you have a large yard. Mowing can be accomplished fairly quickly if you have the right size mower for your lawn. Trimming, on the other hand, can take several hours. Having to go around each ornament, tree, bush or around the boundaries can be quite time-consuming. If you have a large yard, it is probably in your best interest to hire a lawn care company to come in and spray for weeds. If not, you may end up spending the majority of your time stooping over to pull weeds, only to have them reappear in a few short days. Artificial turf eliminates the need for either option and keeps your lawn looking green and clean 365 days a year. Lawns need adequate water to remain green and lush. While some grass seeds are considered drought resistant, they may have to be watered occasionally, especially if you live in an area where high temperatures are common during the summer months. Fertilizing your lawn will be a thing of the past once artificial grass is installed. In areas where extreme temperatures can affect the growth of grass and shrubs, applying fertilizer may be required if you expect to keep your lawn pristine. Artificial turf is ever-green and does not grow or die off. Extreme temperatures do not affect it. If you live in an area that can be arid during the summer months, watering and fertilizing can be done at the same time and whenever it is needed. Artificial grass eliminates the need for both, saving you time and money in the long run. Most landfills no longer accept yard waste. A large majority of communities have started composting facilities where homeowners can take their bagged lawn clippings for disposal. It can take several hours to rake and bag grass clippings if you have a big yard. Even when you use a pull behind lawn rake/collector, the process can still use up a large portion of your day. With a lawn of artificial grass, you no longer have to worry about a lengthy clean up after you mow or trim. Hot, dry seasons and high traffic ca where there is too much shade, not enough water or too many feet constantly treading to and fro. Pets can also cause brown areas to appear, especially in areas where they tend to “do their business”. Having to constantly apply grass seed to high traffic or damaged areas can be time-consuming as well as costly. This entry was posted in Garden, How To Do English Style Gardens Videos, Synthetic Grass by jordan1. Bookmark the permalink.